St John Fisher is the patron of the secondary school I went to. It is still called "The John Fisher School" because it was founded before the canonisation in 1935. 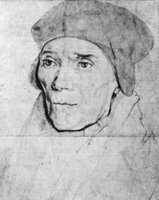 Fr Nesbitt told us stories of St John Fisher when we were boys at the school and he has remained my favourite English martyr - and probably my favourite of all the saints. There are not many biographies of him - most of them are now out of print but Michael Davies wrote a new one shortly before he died. He told me that he did not intend to write anything original, just to provide a biography that people could access. Me thinketh it had bene rather our partes to sticke together in repressinge these violent and vnlawfull intrusions and iniuries dayly offred to our common mother, the holy Church of Christ, then by any manner of perswasions to helpe or sett forward the same. And we ought rather to seeke by all meanes the temporall distruccion of the so ravenous woolves, that daily goe about wyrryinge and devowringe euerlastinglie, the flocke that Christ committed to our Charge, and the flocke that himself dyed for, then to suffer them thus to range abroade. But (alas) seeing we do it not, ye see in what perril the Christen State nowe standeth: We are beseeged on all sides, and can hardly escape the daunger of our enemie: And seeing that iudgment is begone at the howse of God, what hope is there lefte (if we fall) that the rest shall stande! The fort is betrayed even of them that should have defended it. And therfore seeing the matter is thus begunne, and so faintly resisted on our parts, I feare we be not the men that shall see the ende of the miserie. Wherfore seeing I am an ould man and looke not longe to live, I minde not by the help of God to trooble my conscience in pleasing the king this waie whatsoeuer become of me, but rather here to spend out the remnant of my old daies in prayinge to God for him. Let the Pope send him a hat when he will, but I shall provide that whensoever it commeth, he shall wear it on his shoulders, for head he shall have none to set it on. When Pope John Paul wanted to give a speech to the Cardinals reminding them that the cardinalatial red signified a readiness to die for the faith, there was only one Cardinal martyr that he could refer to.